He appeared on the 1880 census taken at Medford MA, listed as a manufacturer of soda water apparatus. 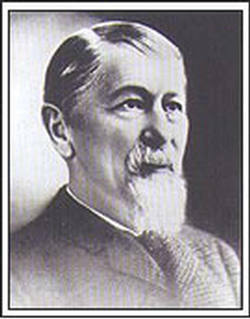 JAMES W. TUFTS, OF MEDFORD, MASSACHUSETTS. Specification forming part of Letters Patent No. 320,513, dated June 23, 1885. Figure 1 is a perspective view of an electrotype-die made in accordance with my invention and used in my improved process of producing ornamental designs on britannia and other soft metals. Fig. 2 is a view of a metal block having thereon the design roughly cut or excavated by hand. 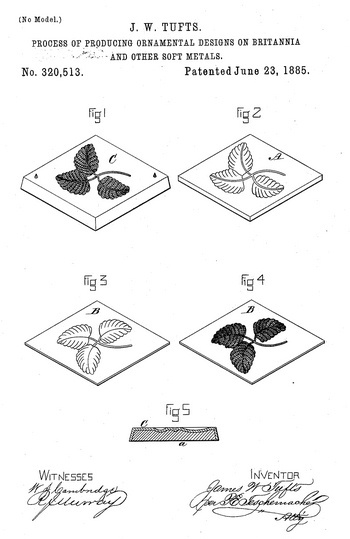 Fig.3 is a view of a soft-metal plate having a counterpart of the design of the block represented in Fig. 2, produced by forcing the said plate onto the said block with a suitable press. Fig. 4 is a view of the plate represented in Fig. 3 with the design thereon finished by engraving thereon by hand the fine and delicate lines, &c., which are to appear upon the finished article ornamented by means of the die shown in Fig. 1. Fig. 5 is a vertical section of the die shown in Fig. 1. 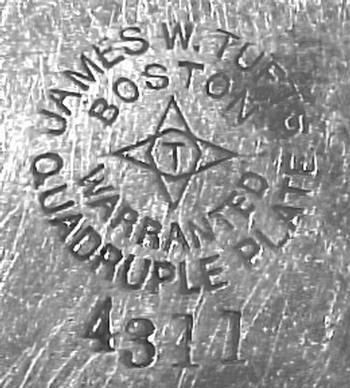 My invention relates to an improved method of producing ornamental designs on britannia and other soft metals, whereby an exact imitation of finely-engraved work can be easily and cheaply produced; and my invention consists in a novel method of making dies for producing the said designs, as is hereinafter fully described, and specifically pointed out in the claim. In carrying my invention into effect I first take a plate or block of metal, A, preferably brass or other suitable hard metal, and roughly cutout, punch down, or excavate thereon by hand the design to be produced, as seen in Fig. 2. I then take a piece of britannia or other suitable soft metal, B, of proper size, and force it by means of a suitable press into the hand-cut mold or die, made as described, whereby a soft-metal counterpart in relief is produced, as seen in Fig. 3. This counterpart is then finished by engraving thereon by hand with suitable tools all of the fine and delicate lines and portions of the design which are to appear upon the finished article to be ornamented, leaving it as seen in Fig. 4. An electrotype is then taken from this hand-finished soft-metal counterpart by suspending it in the decomposing-trough containing the necessary solution and connected with the battery in the usual manner, and allowing it to remain until a sufficient thickness of metal has been deposited, when it is removed and mounted on a block or backing, a, of hard metal, thus forming an electrotype die or mold, G, in intaglio, Figs. 1 and 5, with the desired design thereon containing all of the fine and delicate lines required to produce the desired design upon the finished article, which it would manifestly be impracticable to produce in a hand-cut, die on account of the enormous expense which would be involved in cutting away all of the surrounding metal in order to leave the fine and delicate lines of the design in relief,in order to produce upon the soft-metal article to be ornamented the corresponding depressions in imitation of hand-engraving. After the die C has been produced, as described, the britannia or other soft-metal article upon which the design is to be produced is forced with a heavy pressure into or onto the die C by means of a suitable press in a well known manner, and after being removed therefrom will bear the reverse or exact counterpart of the design of the die, with the lines and fine portions so clearly and sharply defined as to render it impossible to distinguish the work from the best hand-engraving, whereby an immense saving in time and labor is effected, and it will be apparent that my invention is especially well adapted for use in the manufacture of silver-plated ware having fine raised or repousse designs, which can by my method be more easily and cheaply produced than heretofore. The operation of ornamenting a sheet of soft metal from which an article is to be made is performed by placing this sheet over-the electrotype-die, and then by providing the lower face of the presser-die with a counter die the face of which has the outline of the electrointaglio die on its lower face in cameo, it will be seen at a glance that this cameo-die will impress the back of the soft-metal plate, and thus force a corresponding portion of the face of the plate into the intaglio or electro-plate die, thus ornamenting it, as above explained. Electrotype dies have been made in cylindrical form and mounted upon a steel mandrel, as described in the United States Letters Patent granted to myself and Matthew S. Andrews, November 25, 1879, No. 221,985; but these dies have the design in relief, and when the article to be ornamented is passed with a heavy pressure in contact with such a die it is elongated by the rolling action thereof, which causes the design to become distorted or changed from its original shape; but where my improved die is employed there is no rolling of the article to be ornamented, and consequently it is not elongated, and no change in the shape of the figures or lines forming the design results, as the pressure is produced with an ordinary vertical press. Flat electrotype-dies mounted upon a metal backing have also been used; hence I make no broad claim to an electrotype-die, either flat or cylindrical. The herein-described method of making dies for producing ornamental designs on britannia and other soft metals, the same consisting in, first, roughly cutting, excavating, or punching out the design by hand in a metal plate or block, then taking from the mold thus made a soft-metal counterpart by pressing soft metal therein, and subsequently finishing said soft metal counterpart by hand engraving to produce all of the fine lines, &c., which are to appear upon the finished article, and then taking an electrotype from said hand-finished soft metal counterpart to form the die or mold, substantially as set forth. Witness my hand this 9th day of September, A. D. 1884.